Promotions to shop locally probably began when the first store opened in the future site of Everett in 1863, and E. C. Ferguson, along with the Sinclairs, opened a saloon and store the following year in Snohomish, then called Cadyville. 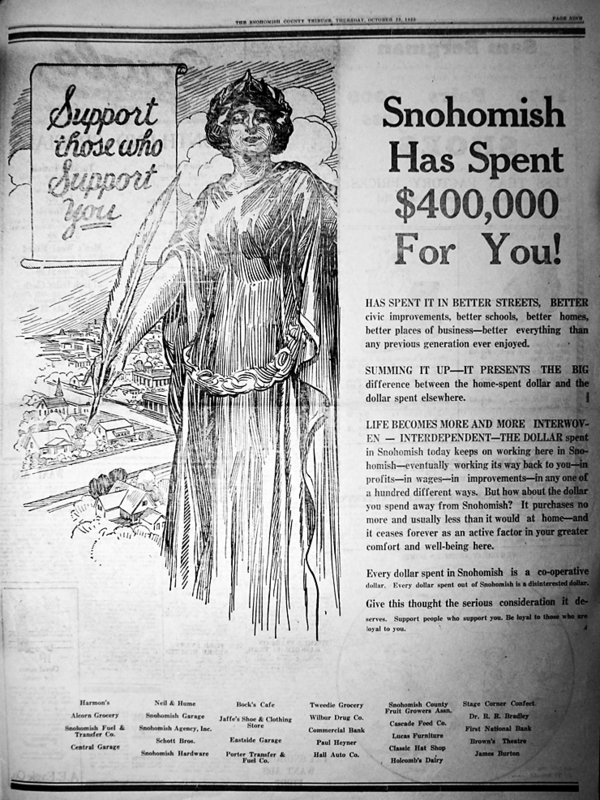 Some 60 years later, with the publication of this month’s historic image of a full page ad in the Snohomish County Tribune, we entered the Renaissance of “shop Snohomish” promotions. 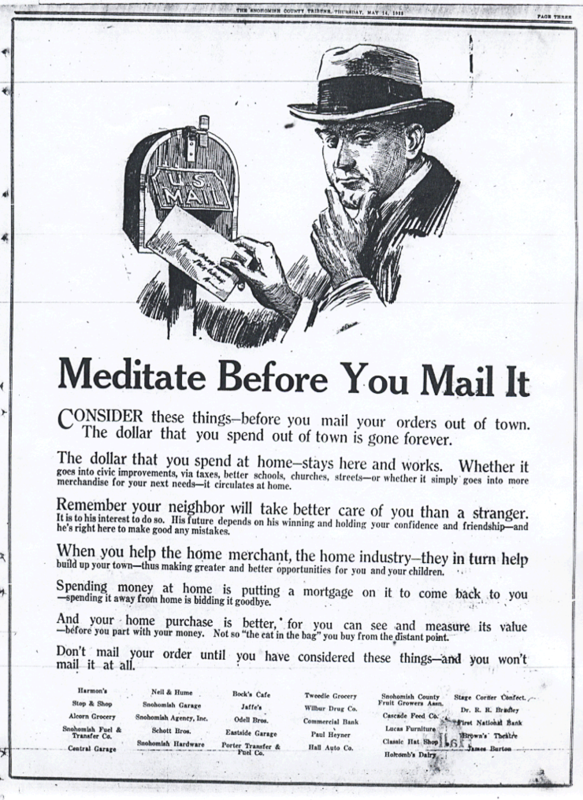 The Tribune published three full page ads in 1925, each one outdone by the next. The selected ad was published in the October 29 issue. (Available in the newspaper collection of our local library.) It’s the only one of the three with a classical theme picturing the Greek Goddess of Wisdom (I guess) watching over the city. The captivating copy informs the reader how much the city has spent over the past year. “[Spent in] better streets, better civic improvements, better schools, better homes, better places of business — better everything than any previous generation ever enjoyed,” reads the first paragraph. 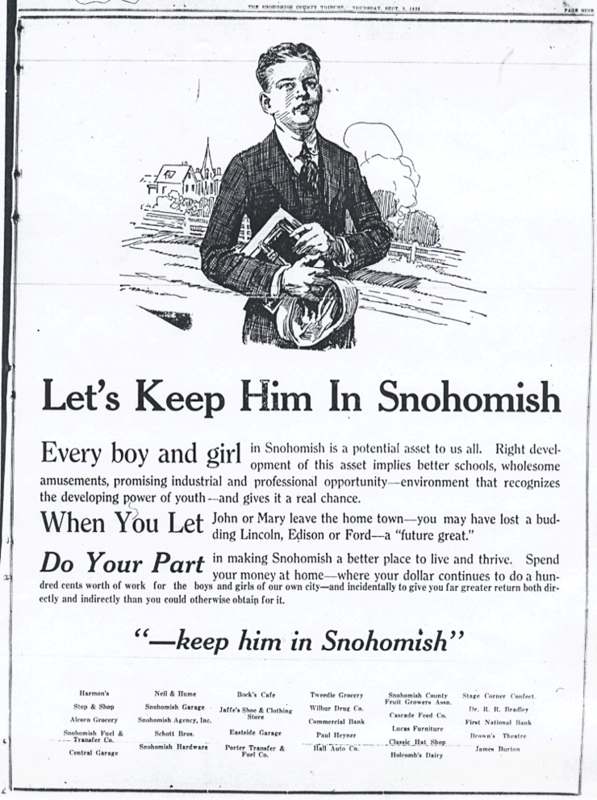 So a contemporary ad might read: “Snohomish Has Spent $9 Million For You!” That makes a point. Pam Osborne, Manager of the Snohomish Chamber of Commerce, informed me that the current “iShop Snohomish” campaign was launched in 2008 by a group of businesses, city staff, council members and organizational leaders. And it’s striking how similar the language of persuasion around this issue of shopping locally is after 85 years. I would be amiss as an author if I didn’t remind you of two items. First, my book “Early Snohomish” is available very locally, at the Blackman House Museum, open weekend afternoons, at Kusler’s on Avenue D, and here (at the sidebar link) — all sales benefit the Snohomish Historical Society. And secondly, I am proud to let you know that “Snohomish: Historic Downtown Cybertour” has been published on HistoryLink.org. The commission confirms, as does writing this column every month, that there is always more to discover in the rich history of Snohomish. Wishing you all a new year of happy local history. This entry was posted in Posts and tagged shop snohomish on December 21, 2011 by warner.